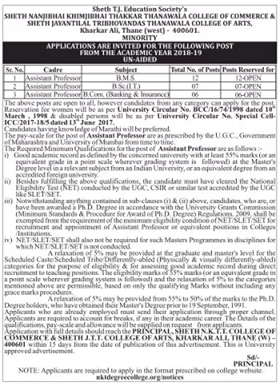 SNKTT College of Commerce and Arts, Thane has advertised in LOKSATTA for the recruitment of Assistant Professor jobs vacancies. Interested and eligible job aspirants are requested to apply with in 15 days. Check out further more details below. About College: Sheth N.K.T.T. College of Commerce and Sheth J.T.T College of Arts, permanently affiliated to the University of Mumbai is a multifaculty institution of higher education that has more than 2000 students on its rolls, pursuing studies in several undergraduate courses. In addition, the college imparts instruction to students pursuing studies through Yashwantrao Chavan Maharashtra Open University, Nasik.